You will qualify for this card if you are registered for a CSCS recognised construction related qualification. Trainees must have passed the appropriate CITB Health, Safety & Environment Test within the last two years of applying for the Trainee Card. The card is valid for 5 years and is non-renewable. 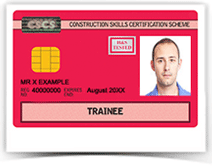 To apply/renew this RED CSCS CARD please click here.